Patriarch Bartholomew’s recent letter to Archbishop Anastasios of Albania has generated considerable discussion, including on these pages: previously, we examined his reference to the Council of Carthage and his mischaracterization of the Meletian Schism. More significantly, on 28 March, Archbishop Anastasios responded to Patriarch Bartholomew with a remarkable letter, in which he directly addressed the Patriarch’s purported historical precedents. We strongly recommend that all of our readers examine Archbishop Anastasios’ letter. This ancient practice of the Church, which concurs with the Ecclesiastical Canons, is also explicitly confirmed by the four Patriarchs of the East, namely our own Predecessor Dionysios III, Paisios of Alexandria, Makarios of Antioch, and Nektarios of Jerusalem, in a Tomos of the year 1663, by which they settled twenty-five chapters of inquiries posed to them by clergy of the Russian Church. In the eighth question: “Whether every decision of other Churches may be appealed to the Throne of Constantinople for final determination in all Ecclesiastical matters?”, they replied that “This prerogative belonged to the Pope before he broke with the Catholic Church… Since the Schism, however, matters of all Churches are referred to the Throne of Constantinople, from which they receive determination.” The same is repeated in responses to the twenty-first and twenty-second questions. In 1663, the Russian Orthodox Church was in the midst of a great crisis, and the Eastern Patriarchs had been appealed to in the matter of the deposition of Patriarch Nikon of Moscow. The Russian Church submitted a series of questions to the Eastern Patriarchs, who responded with a Tomos in a question-and-answer format, which they formally issued in 1664. Patriarch Bartholomew references Questions 8, 21, and 22, and partially quotes from number 8 (full translations and the Greek originals are provided below the present article). His presentation of its answers gives the appearance that the Eastern Patriarchs supported the unilateral resolution, by the See of Constantinople, of all appeals from the other Churches. However, this is by no means an accurate portrayal of the text. Whether every judgment of the other churches is referred to the See of Constantinople and from her each ecclesiastical case receives a conclusion. This privilege belonged to the Pope of Rome before splitting from the Catholic Church out of arrogance and willful wickedness, but now that he has split, the issues of all the Churches are referred to the See of Constantinople and from her receive decisions, as it has the same primacy that Old Rome held, according to the canons, for the Fourth Canon of Sardica says, “If any bishop is deposed by the judgment of bishops who happen to be neighboring, and asserts that he has fresh matter in defense, a new bishop be not settled in his see, unless the bishop of Rome judge and render a decision as to this.” That this privilege is transferred to the Ecumenical See, you may learn from many, not least from the scholia of the great Nomocanon, which say, “From this canon, the Romans raised themselves to arrogance, and of old putting it forward as as from [the Council] in Nicaea, their leaders were proven villains, as the Synodical preamble of the Council of Carthage itself makes clear”. And further down, “the bishops of Old Rome boast that through this canon they were given all the appeals of the bishops” and further down says, “not all the appeals of the bishops are referred to him, but those of eparchies under him, those which,” he says, “later were placed under Constantinople, as their appeals henceforth also appertain to the latter.” And from Balsamon, “the special privileges defined do not belong to the Pope himself alone, but are understood also to belong to the [bishop] of Constantinople.” Since the bishop of Rome has broken off from the Catholic Church, they are only referred to the Ecumenical Throne. If the other Patriarchs also agree, if it happens to be a major issue, the resulting verdict is inalterable. Far from authorizing a unilateral right of appeals for Constantinople, Question 8 affirms the right of Constantinople to resolve appeals, but for this resolution to be final on any major issues, it must be done with the unanimous consent of the other Patriarchs. This is a faithful application of Apostolic Canon 34, which states, “But neither let him [who is the first] do anything without the consent of all.” It is also consistent with the words of Archbishop Job of Telmessos in 2009, applying Canon 34 to the pan-Orthodox level: “The ecumenical patriarch has a right to accept letters of appeal and care for the unity of the church by convening all-Orthodox meetings attended by heads of each patriarchate and autocephalous church (or their representatives) but he cannot decide anything himself, without them, unilaterally.” In recent months, Patriarch Bartholomew appears to have introduced an innovation into the theology of the Church, repudiating both Apostolic Canon 34 and, by extension, the 1663/4 Tomos of the Eastern Patriarchs that he paradoxically cites as authoritative. Moreover, the bulk of the response to Question 8 does not serve to bolster the Ecumenical Patriarch’s prerogatives, but rather strictly limits them, pointing out that Constantinople only has the privilege of hearing appeals from eparchies that were under Rome prior to the schism. Even more relevant to the current situation, the response warns that an exaggerated insistence on the privilege of hearing appeals led Rome into the “arrogance” that eventually caused it to break from the Church, an arrogance foreshadowed by Rome’s willingness to misrepresent the canons of an Ecumenical Council during the Council of Carthage, where Rome’s representatives sought to bolster the authority of Canon 4 of Sardica by claiming that it was a canon of the Council of Nicaea. Patriarch Bartholomew’s citation of Questions 21 and 22 is simply puzzling. Question 22 does not refer to the unilateral authority of the Ecumenical Patriarchate, but rather the authority of a decision made by “the Ecumenical See, and the Patriarchs with it,” once more expressing an ecclesiology rooted in Apostolic Canon 34. Question 21 has no connection at all to the right of appeal or the privileges of the Ecumenical See, but rather addresses whether a metropolitan or patriarch can be judged by bishops that he ordained. It closes by stating that “paternity and sonship have no place in the matter of justice and certainly not in ecclesiastical issues, as spiritual danger ensues”– as concise a refutation of Constantinople’s “Mother Church” ideology as can be imagined. Patriarch Bartholomew has exhibited a pattern of willful inaccuracy that calls into question every historical claim he makes. We simply cannot trust the Patriarch to behave in an honest manner — we cannot trust that he speaks the truth. Sadly, we are reduced to fact-checking the words of the primus inter pares of the Orthodox Church, a man who should be our leader in the faith and a model of holiness. Once again, we beg His All-Holiness to repent of his dishonesty and to return to the path of truth, even — especially — when truth seems to be against the selfish interests of the Ecumenical Patriarchate. This privilege belonged to the Pope of Rome before splitting from the Catholic Church out of arrogance and willful wickedness, but now that he has split, the issues of all the Churches are referred to the See of Constantinople and from her receive decisions, as it has the same primacy that Old Rome held, according to the canons, for the Fourth Canon of Sardica says, “If any bishop is deposed by the judgment of bishops who happen to be neighboring, and asserts that he has fresh matter in defense, a new bishop be not settled in his see, unless the bishop of Rome judge and render a decision as to this.” That this privilege is transferred to the Ecumenical See, you may learn from many, not least from the scholia of the great Nomocanon, which say, “From this canon, the Romans raised themselves to arrogance, and of old putting it forward as* from [the Council] in Nicaea, their leaders were proven villains, as the Synodical preamble of the Council of Carthage itself makes clear”. And further down, “the bishops of Old Rome boast that through this canon they were given all the appeals of the bishops” and further down says, “not all the appeals of the bishops are referred to him, but those of eparchies under him, those which,” he says, “later were placed under Constantinople, as their appeals henceforth also appertain to the latter.” And from Balsamon, “the special privileges defined do not belong to the Pope himself alone, but are understood also to belong to the [bishop] of Constantinople.” Since the bishop of Rome has broken off from the Catholic Church, they are only referred to the Ecumenical Throne. If the other Patriarchs also agree, if it happens to be a major issue, the resulting verdict is inalterable. *Here we follow the 19th century translation of William Palmer in reading the nonsensical οἱ as a scribal mistake for ὡς. If a Metropolitan or Patriarch, being liable, is judged by the bishops around him, and by chance he grew up in that eparchy and so it happens that all the bishops around him were ordained by him, is it possible not to accept the verdict carried out against him by them, as he is truly called their father and they have had the rank of sons with him? If someone rebels against their verdict and takes recourse to appeal, what happens? 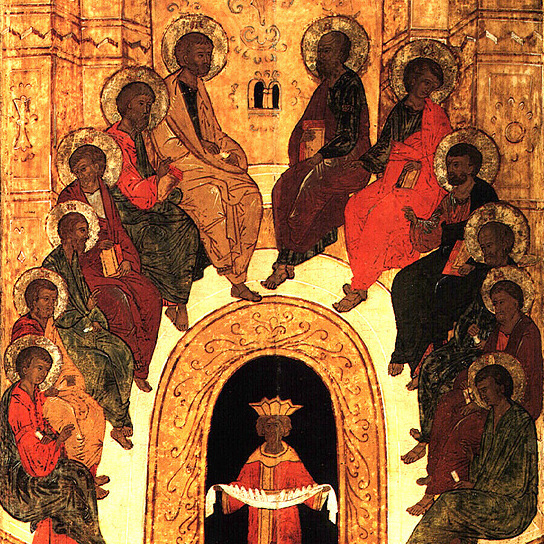 The judgment of the Ecumenical See and the Patriarchs with it against him in writing, inasmuch as it appears legitimate and according to the canons, as is said above, (as [the See] possesses by the canons this privilege), let it prevail against him, with no other plea remaining in this matter. Τὸ προνόμιον τοῦτο τῷ Πάπᾳ Ρώμης ἤν πρὸ τοῦ διαρραγῆναι τῆς καθολικῆς Ἐκκλησίας ὑπὸ ἀλαζονίας καὶ έθελοκακίας· ἤδη δὲ ἐκείνο διαρραγέντος, αἱ ὑποθέσις πᾶσαι τῶν Ἐκκλησιῶν εἰς τὸν τῆς Κωνσταντινουπόλεως θωόνον ἀναφέρωοντι, καὶ παρ᾽ αὐτοῦ τὰς ἀποφάσεις λαμβάνουσιν ὡς τὰ ἵσα πρωτεῖα κατὰ τοὺς κανόνας ἔχοντος τῆς παλαιᾶς Ρώμης· φησὶ γὰρ ὁ τέταρτος κανών τῆς Σαρδικῆς· αἐάν τις ἐπίσκοπος καθαιρεθῇ τῇ κρίσει τῶν ἐπισκόπων τῶν ἐν γειτνίᾳ τυγχανόντων, καὶ φάσκῃ πάλιν ἑαυτῷ ἀπολογίας πρᾶγμα, μὴ πρότερον εἰς τὴν καθέδραν αὐτοῦ ἕτερον ἀποκαταστῆναι, εἰμὴ ὁ τῆς Ρώμης ἐπίσκοπος ἐπιγνοὺς περὶ τούτο ὅρον ἐξενέγκοι· ὅτι δὲ τὸ προνόμιον τοῦτο ἐπὶ τὸν Οἰκουμενικὸν Θρόνον μετενήνεκται, μάθοις, ἂν ἐκ πολλῶν, οὐχ ἦττον δὲ ἐκ τῶν σχολίων τοῦ μεγάλου Νομίμου λεγόντων· «ἐκ τοῦτου τοῦ κανόνος τὸ ρωμαϊκὸν ἦρται εἰς ἀλαζονίαν· καὶ τοῦτον οἱ [read: ὡς] τῆς ἐν Νικαίᾳ πάλαι προβαλλόμενοι ἐπι τῆς ἐν Καρθαγένῃ Συνόδου ἑάλωσαν κακοῦργοι οἱ τούτων προεδρεύοντες, ὡς αὐτὸ δηλοὶ τὸ Συνοδικὸν προοίμιον τῆς ἐν Καρθαγένῃ» · καὶ κατωτέρω, «ἐκ τούτου τοῦ κανόνος αὐχοῦσιν οἱ τῆς πρεσβυτέρας Ρώμης ἀρχιερεῖς ἐνδεδόσθαι αὐτοῖς τὰς ἐκκλητοὺς πάσας τῶν ἐπισκόπων»· καὶ παρακατιὼν φησίν. «οὐ πάσας τὰς ἐκκλητοὺς τῶν ἐπισκόπων ἀνατίθησιν αὐτῷ, ἀλλὰ τῶν ὑποκειμένων αὐτῷ ἐπαρχιῶν, αἵτινες, φησὶν, ὕστερον τῷ Κωνσταντινουπόλεως ὑπετέθησαν, ὡς ἐκείνῳ λοιπὸν καὶ τὰς ἐκκλήτους αὐτῶν ἀνήκειν» · καὶ ἐκ τοῦ Βαλσαμῶνος· «μὴ εἶναι τὰ περὶ τοῦ Πάπα ὁρισθέντα εἰδικὰ τούτου καὶ μόνου προνόμια, ἀλλ᾽ ἐξακούεσθαι καὶ εἰς τὸν Κονσταντινουπόλεως· ἔδη δὲ ἀπορραγέντος τοῦ ἐπισκόπου τῆς Ρώμης ἀπὸ τῆς καθολικῆς Ἐκκλησίας, μόνον εἰς τὸν Οἰκουμενικὸν ἀναφέρονται Θρόνον. εἰ δε συναινοῦσι καὶ οἱ λοιποὶ πατριάρχαι, εἰ τυχὸν εἴη μείζων ὑπόθεσις, ἀμετάβλητος ἔσται ἡ ἐξενεχθεῖσα ἀπόφασις». Ἡ σχέσις πολυσχέδιός ἐστι κατὰ τοὺς περὶ ταῦτα ἐμπείρους καὶ κατὰ τὸ εἶναι, καὶ κατὰ τὸ λέγεσθαι· καὶ λαμβάνεται κατὰ τὴν διάφορον τῶν ὑποκειμένων ἀναφοράν· φέρε εἰπεῖν, ὁ ἄνθρωπος πρὸς τὸ αὐτοῦ γέννημα ἀναφερόμενος λέγεται γεννήτωρ καὶ τὴν τῆς πατρότητος κέκτηται σχέσιν· ᾖ δὲ ἄνθρωπος κατὰ τὴν σχέσιν τῆς ταυτότητος καὶ τὸν τοῦ ἀνθρώπου ὁρισμὸν ἀναφερόμενος πρὸς τὸ γέννημα, οὐδὲ μίαν ἔσχηκε διαφοράν· οὕτω τοι Μητροπολίτης τυχὸν, ἢ πατριάρχης, ὡς μὲν Γέρων τούτων, κατὰ τὸν τῆς χειροτονίας λόγον ἀναφερόμενος, εἴσαν ἂν ἐκείνοι τούτου υἱοὶ, κατὰ δὲ τὴν τῆς ἀρχιερωσύνης ταυτότητα καὶ τὸ τῆς πατρικῆς ἀξίας μεγαλεῖον, συναδελφοὶ καὶ συναρχιερεῖς λέγονται, καὶ αὐτοῦ τοῦ ἑνὸς Θεοῦ διάκονοι. ὅθεν καὶ ὁ μακάριος Παῦλος ἐν ταῖς αὐτοῦ ἐπιστολαῖς νῦν μὲν τέκνα φησὶν, ὡς ὑπ᾽ αὐτοῦ φωτισθέντας· τέκνον Τιμόθεε καὶ τέκνον Τῖτε· νῦν δὲ καὶ ἀδελφοὺς, ὡς Ἀποστόλους· καὶ ὁ Κύριος οὐκ ἐπαισχύνεται τοὺς χριστιανοὺς ἀδελφοὺς ἀποκαλεῖν· «καὶ πάλιν ἰδοὺ ἐγὼ καὶ τὰ παιδία ἅ ἔδωκεν ὁ Θεός». Συνάγεται τοίνυν ἐκ τούτων κατὰ μὲν τὴν τῆς χειροτονίας σχέσιν καὶ τὴν τῆς τάξεως πατέρα εἶναι τοῦτον τοῖς περὶ αὐτὸν ἐπισκόποις, κατὰ δὲ τὸν λόγον τῆς ἀρχιερωσύνης καὶ τὸν τῆς πατρικῆς ἐξουσίας, συναδελφοὺς εἶναι καὶ συναρχιερεῖς, ὥστε οὐδὲ μίαν χώραν ἕξειν τὸ λέγειν, ὅτι οὐ δύναται οἱ ὑπ᾽ αὐτοῦ χειροτονηθέντες ἀρχιερεῖς κρίνειν αὐτὸν, ὑπεύθυνον ὄντα κατὰ τοὺς θείους κανόνας, καὶ ψῆφον ἐπενεγκεῖν τὴν ἔννομον κατ᾽ αὐτοῦ. πατρότης γὰρ καὶ υἱότης οὐκ ἔχουσι χώραν ἐν τῷ τοῦ δικαιοσῦνης λόγῳ καὶ μάλιστα περὶ ἐκκλησιαστικῶν ὑποθέσεων, ὅτε κίνδυνος ψυχικὸς ἐπιφέρεται. φησὶ γὰρ ὁ Θεόλογος: «ὁ τἆλλα πραὺς, ὅταν ἴδῃ Θεῷ ζημιούμενος ὄντως γίνεται μαχητής». Ἡ παρὰ τοῦ Οἰκουμενικοῦ Θρόνου καὶ τῶν μετ᾽ ἐκεῖνον Πατριαρχῶν ψῆφος ἐπενεχθεῖσα κατ᾽ αὐτοῦ ἐγγράφως καθ’ ὅτι ἀν δόξῃ νόμιμον καὶ κατὰ κανόνας, ὡς ἀνωτέρω εἴρηται, ἐσχηκότος παρὰ τῶν κανόνων τὸ τοιοῦτο προνόμιον, κρατείτω κατ’ αὐτοῦ, μηδὲ μιᾶς ἄλλης προφάσεως ὑπολεπομενης ἐν τούτῷ. Previous Fr. John Cox: Is There a Future for Conciliar Orthodoxy after Ukraine?